The Ostern (Easter) holiday, which was observed on the Sunday after the first summer moon as established by the Holy Synod in 325 C.E., has its origins in pre-Christian beliefs. In pagan times, the term Easter referred to the name of the Germanic goddess Ēostre. 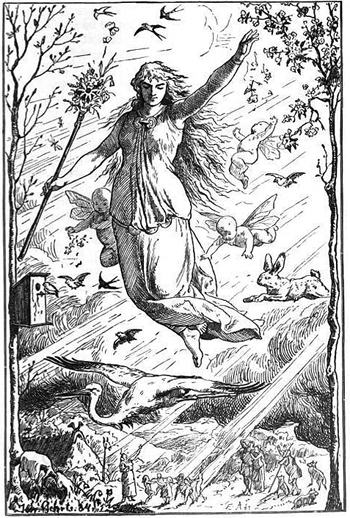 The 19th century scholar Jacob Grimm proposed the existence of a form of Ēostre (Eastre) among the pre-Christian beliefs of the continental Germanic peoples, whose name he reconstructed as Ostara. Ostara was associated with the coming of spring and the dawn, and her festival is celebrated at the spring equinox because she brings renewal and rebirth from the death of winter. A drawing titled Ostara (1901) by Johannes Gehrts. The goddess Ostara flies through the heavens surrounded by Roman-inspired putti, beams of light and animals. Germanic peoples look up at the goddess from the realm below. Source: Wikimedia Commons. As Christianity spread over Europe, the pagan traditions of the Germanic tribes were adapted to the new belief system. When the second-century Christian missionaries encountered the tribes of the north with their pagan celebrations, they attempted to convert them to Christianity. They did so, however, in a clandestine manner. It would have been very dangerous for the very early Christian converts to celebrate the Holy Days with observances that did not coincide with celebrations that already existed. To save lives, the missionaries cleverly decided to spread their religious message slowly throughout the populations by allowing them to continue to celebrate pagan feasts, but to do so in a Christian manner. As it happened, the pagan festival of Eastre occurred at the same time of year as the Christian observance of the Resurrection of Christ. It made sense, therefore, to alter the festival itself, to make it a Christian celebration as converts were slowly won over. The early name, Eastre, was eventually changed to its modern spelling, Easter. The Protestant Reformation sparked by Martin Luther in 1517 again modified the traditions of Holy Week and Easter. The tradition of the Easter hare or rabbit is first found in German literature in the 1570s. Germanic Easter traditions continued to evolve and were carried to Russia by the colonists in 1766. The physical environment and exposure to Russian culture also shaped the holiday customs of the Volga Germans. The Christian Heilige Woche (Holy Week) leading up to Easter made it a special time of year and one of the most important holidays in Norka. On Palmsonntag (Palm Sunday), the entire congregation took communion at the church with the new confirmands who were practicing this ritual for the first time. The days leading up to Gründonnerstag (Maundy Thursday) were very festive (in German the day is known as Green or Mourning Thursday, in English it is known as Holy or Maundy Thursday). All celebrations ceased on Gründonnerstag when services were held in the church as they were again on Karfreitag (Good Friday). Eggs were usually colored on Karsamstag (Holy Saturday). The Volga Germans, as did the Russians, colored their eggs red or a golden tan by using onion peel, purple or pink by using beet juice, and blue by using red cabbage leaves. The colonists also gathered herbs that sprouted in the early spring on hilltops and dry places. Plants such as Eierkräutchen (the lichen Parmelia saxatilis) were used to give the eggs a golden color. Bohnenkraut, an herb that grew on the hills, was used to give eggs a vivid dark green color. Sprouts from young birch trees were gathered to produce an extract that was also used to color the eggs. Saturday was also a day when everyone did a full and detailed cleaning of their house and yard. Streets and common areas were also cleaned. When the cleaning was complete, homes were decorated with greenery to ward off evil spirits. The floors of homes and the street areas leading to the gate of each house was sprinkled with white sand. On the days leading up to Easter, the women prepared food for the coming Easter weekend. A roasted chicken and noodle soup were traditional foods for the Easter Sunday meal. The noodle dough was prepared on Saturday. On Easter morning, the dough was rolled out into thin sheets which were placed on the bed pillows to dry. Prior to the end of the Easter morning sermon, the noodles were cut into very thin strips. The noodles were placed into the chicken broth after the ringing of the church bell when the pastor began the reading of the Lord's Prayer. At the second ringing of the bell the chicken was stuffed and placed in the oven. Baked goods such as Riwwelkuchen and Pfefferkuchen were made from leavened dough. A syrup, made from boiled sugar beets was used in place of granulated sugar, gave the pastries an aromatic and dark color. Simple cookies were also made. Flour, salt and baking soda and were formed into the shape of dolls (Puppen). Other cookies were flavored with jam and fennel. Some of the women made Schichtkuchen (Napoleons) which were a special treat. On Easter morning the children sprung from their beds eager to find what the Osterhase (Easter rabbit) had brought for them. In Norka, the Easter rabbit brought colored eggs that were placed in a hat by the door of the house or in a nest of sand prepared beforehand in one of the corridors inside the house. Some may have also planted barley in a dish and waited for it to sprout. The sprouts where then used that as a nest for the eggs. After the children received their nest of eggs they had breakfast and went to visit their godparents who provided them with more treats. After the Easter morning church service and family dinner, the adults went out visiting from house to house. Guests were often greeted with Schnapps, coffee, and cakes. Children were given colored eggs and sweets. Young girls and children often went out into the fields to gather tulips and played on swings that were set up for the Easter holiday. Payment of one egg allowed a child to swing for 3 to 5 minutes. Young people as well as the older generations would dance fast polkas and the "skipping" waltz. Ostermontag (Easter Monday) celebrated the risen Christ and saw the observance of secular traditions. Many games were played including Eierschuhwelle. This game was played on a square or triangle. One one side of the shape each player dug a small pit. The player who could tip their egg into the small pit received the egg. Another variation of this game was played by drawing a line in the dirt on which every player placed an egg 1/4 of an arschin (an old Russian measure equal to 28 inches) apart from each other. The players then stood a predetermined distance away from the line of eggs and, in order, they each threw an egg attempting to strike another egg on the line. A successful hit meant that person could keep the egg. Many people played the traditional game of egg knocking to see whose egg would survive the blow without breaking the shell. Bunnock, a game somewhat like lawn bowling, but played with painted horse bones, was also popular. Two teams would line up about 33 feet opposite each other and attempt to knock down the other teams line of 22 bones, known as soldiers and guards. The first team to knock down all of their opponents bones won the game. The game of Bunnock is said to have been created by Russian soldiers to pass the time while stationed in Siberia during the early 19th century and was adopted by the Volga Germans. Young men would often stay up until sunrise as they strolled through the village and sang Gasse Lieder (street songs) with bawdy lyrics, which the adults ignored. If Easter wasn't too early in the season, the men would go out to the fields in the evening to get a head start on plowing and sowing. Dietz, Jacob E. History of the Volga German Colonists. Lincoln, Neb. : American Historical Society of Germans from Russia, Printed by Augstums Printing Service, 2005. 369. Print. Olson, Marie Miller., and Anna Miller. Reisbick. Norka, a German Village in Russia. Denver: S.n., 1981. 22. Print. Spady, Jim. "The Easter Egg Roll". Norka Newsletter. Summer 1998. "The Official Bunnock Website - A Game for All Ages!" The Official Bunnock Website. Web. 28 Nov. 2014. <http://www.bunnock.com/>. Yerina, Elizabeth M. "Christmas and Other Traditional Holidays of the Germans on the Volga." Trans. Rick Rye. American Historical Society of Germans from Russia Journal 21.3 (1998): 7-12. Print. Yerina, Elizabeth. M., and V. E. Salʹkova. Obychai Povolzhskikh Nemt︠s︡ev = Sitten Und Bräuche Der Wolgadeutschen. Moskva: Gotika, 2000. 64-85. Print. Last updated July 6, 2018.